Back cover blurb: With her fortieth birthday approaching, Lucy Carpenter dares to hope that she finally has it all: a wonderful new husband, Jonah, a successful career and the chance of a precious baby of her own. Life couldn’t be more perfect. But the reality of becoming parents proves much harder than Lucy and Jonah imagined. Jonah’s love and support is unquestioning, but as Lucy struggles with work and her own failing dreams, the strain on their marriage increases. Suddenly it feels like Lucy is close to losing everything… Heart-wrenching and poignant, this latest work by bestselling author Amanda Prowse asks the question: what does it mean to be a mother in today’s hectic world? And what if it’s asking too much to want it all? 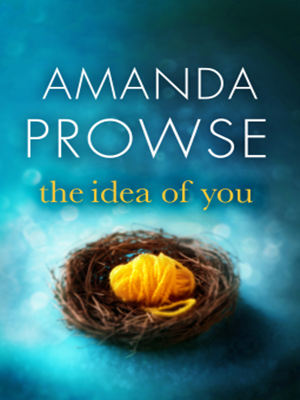 The idea of you the second Amanda Prowse novel that I've read, and again it addresses a sensitive and difficult subject matter with literary brilliance. Lucy Carpenter is approaching Forty, she thought she was doomed to be left on the shelf until she meets Jonah at a Christening. They are so surely made for each other that they waste no time in arranging their own marriage and settling down to have children. However the reality of becoming parents, or at least trying to become parents is far more difficult than either of them imagined. Both are desperate for a child to make their new family completed. Jonah has a teenage daughter from a previous relationship, whilst Lucy has a particularly fraught relationship with the Mother and Sister, and not much else. When Lucy finds out she is at last pregnant, she is ecstatic. But she and Jonah decide not to tell anyone for a little while. Lucy sadly miscarries, but the doctors tell her not to worry, it is common at first, and there should be no reason not to try again when the couple are ready. And so begins the cycle again. Meanwhile Jonah's daughter Camille is sent over from France to live with Lucy and Jonah for the Summer. Lucy tried hard to build a relationship with her, but Camille is stand-offish at best, sullen, rude and unpredictable at her worst. When Lucy discovers she is once again pregnant, she can't wait to share her news with Jonah, but their joy may well be short lived with Camille around to turn their lives upside down. The idea of you is a hugely important novel about family relationships and how we deal with tragedy. At times it is an emotional read, so you may need a box of tissues! The idea of you is available now via Amazon online.